If you’ve been wondering, amazed, at how fifty-year-old Japanese models look like twenty somethings, then welcome to the Disneyland that is Japan’s cosmetic industry. With faces that never age, skin that never blemishes, and hair that stays put for days, Japanese women have been the envy of the rest of us mortals thanks to their superb Japanese beauty products—once a well-kept secret, now out in the open. Indeed, if you’re into all things beauty, rest assured you’re never going to have to look beyond the expansive aisles of Japan’s beauty stores again. From absolute must-haves like Collagen Source Balls and Camellia oil to downright quirky ones like Placenta Essence (yes, you read that right), if you’re the kind that takes your skin care and makeup seriously, this is one pilgrimage you ought to be making. That said, here’s a list of 15 freakishly awesome Japanese beauty products you absolutely must get your hands on! The DHC Deep Cleansing Oil is a unique water-soluble formula that provides a thorough cleanse. Amongst the world’s leading cleansers in removing makeup, it also nourishes and hydrates the skin thanks to its fullness of vitamins and antioxidants, leaving your skin looking young and refreshed. As per reports, 92% of participants in a certain study agreed that the DHC Deep Cleansing Oil worked better than a leading cleansing product at removing makeup. Apparently, one bottle is sold every 10 seconds worldwide. That alone should tell you what a punch this one product packs. DHC’s Deep Cleansing Oil is a runaway success with most people that use it, including yours truly. What I particularly like about this product is how easy it is to use. Come back home from a tiring day, get some of the oil in your hands, rub it on your dry face, and voila!, you’re done. I cannot remember the last time it was so easy to get makeup off my face, especially foundation. 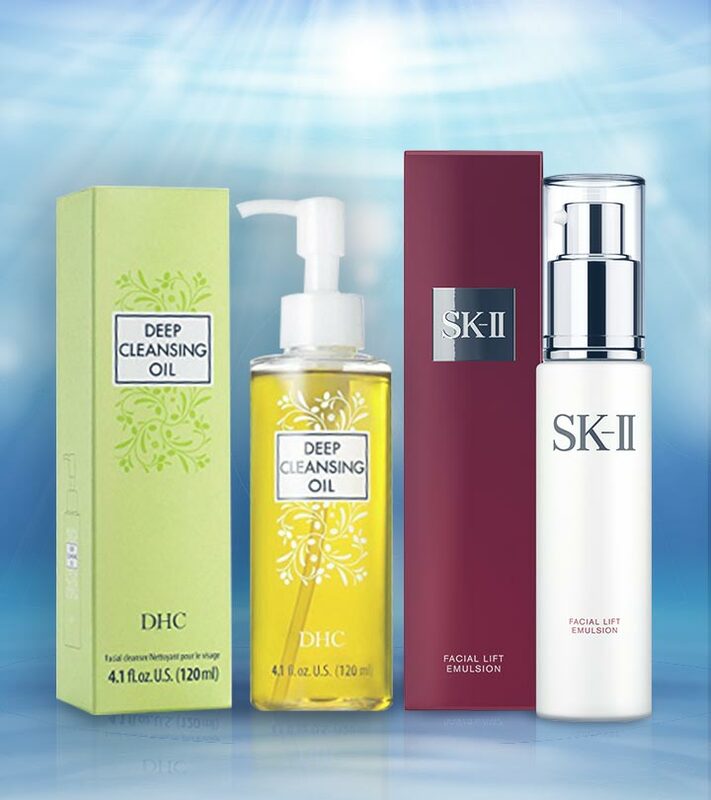 DHC’s Deep Cleanse Oil makes the process a breeze. It’s worked well on removing my waterproof mascara and eyeliner too. Some users have had issues with using oil on their faces as a cleanse, but I feel that’s a matter of personal choice. I find that getting the oil off the face is just as easy as applying it, as a few splashes of water helps get rid of ALL OF IT. No stickiness, no greasiness, just petal soft skin and a constant need to touch it! Important Note: Certain users on Amazon have complained about getting the wrong product, or a rip-off. While we can’t be certain whether the fault lies with Amazon, the supplier, or the manufacturer, it would probably be a good idea for you to double check if the product you’ve received is the right one. It definitely is worth it. 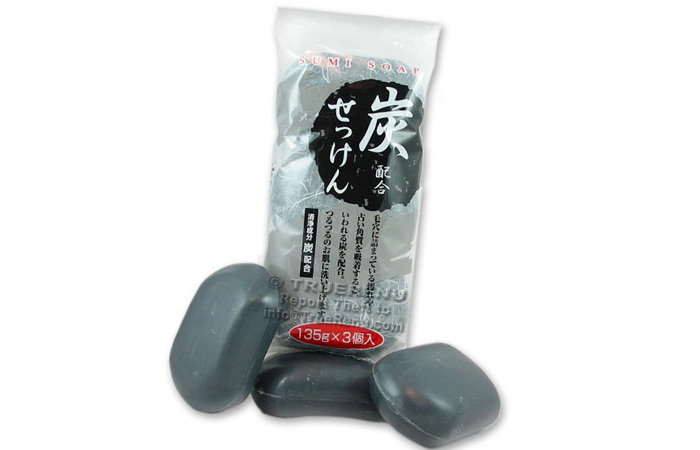 The Sumi Haigou Settuken Charcoal Bar Soap is, as the name suggests, a special charcoal formulation. Being an adsorbent, charcoal is known for its efficiency at extracting impurities from the skin. Works especially well on all skin types. Exfoliates and moisturizes the body too. Charcoal seems to be the buzzword in skin care these days—activated charcoal soaps, bamboo charcoal soaps, handcrafted charcoal soaps—charcoal and its products are everywhere. I for one am not complaining though. My tryst with Sumi Haigou Settuken’s Charcoal Bar Soaps has been nothing short of a success. I have dry skin and dry hair because of which most drugstore soaps are a strict no-no for me, especially on the face. Sumi Haigou Settuken’s Charcoal Bar Soaps solve that problem though. Upon use, I found that the soaps don’t strip the body of any essential oils, leaving it moisturized at all times, including the face (woohoo!). An added benefit is that these soaps function as both cleansers and exfoliators, as they do a fine job of removing dirt and grease. During summers, I tend to have small breakouts on my face due to the heat (sweat, dust and pollution make for a bad combination). I’m happy to report that The Sumi Haigou Settuken’s Charcoal Bar Soaps helped deal with that problem to a great extent too. A Win for life! The description for the product on Amazon reads ‘pure, lightweight miracle’, and rightly so. 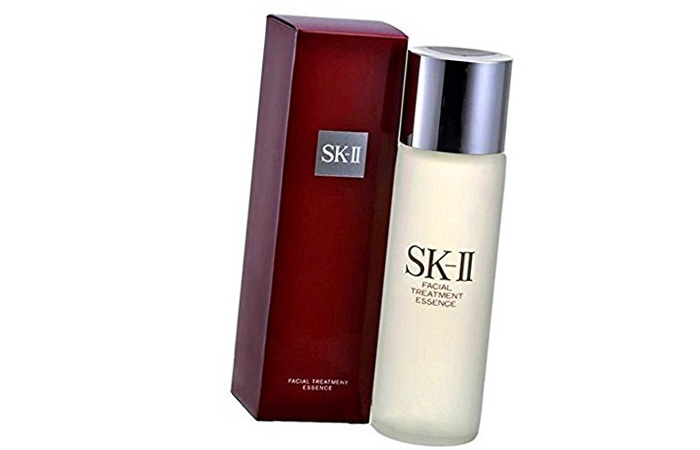 SK-II is a Facial Treatment Essence that absorbs quickly into the skin (read 15 seconds). Containing an anti-aging ingredient called Pitera (a derivative of yeast), SK-II gently exfoliates and helps moderate the skin’s surface renewal cycle leaving your skin with a soft, gentle glow. In fact, the SK-II Facial Treatment Essence is a powerful product that works on all five dimensions of beautiful clear skin—less visible spots, reduction in the appearance of wrinkles, refined skin texture, improved firmness, and radiance. All in one solution for five skin problems—spots, wrinkles, rough and dry skin, sagging and dullness. SK-II’s Facial Treatment Essence is a mixed bag, rather a bottle, of emotions for me. I’ve used it once or twice, and while it sure did seem refreshing, I didn’t notice any extraordinary change. While this could be because I’m still on the younger side of my twenties, and don’t have any skin issues as such, most friends and colleagues who’ve used this had a similar verdict. Mixed. 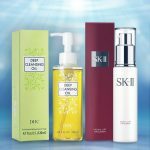 However, for those who it has worked, SK-II’s Facial Treatment Essence is a game changer, so much so that, price notwithstanding, they’ve stocked up on bottles of what they call ‘the miracle water’. An interesting observation I’ve made with people who it works for is that they started early, and by early I mean, late teens/early twenties. Such friends of mine have reported the appearance of less to no laugh lines or wrinkles, a cause for much envy amongst onlookers, and the reason why SK-II’s Facial Treatment Essence makes it to this list. Chojyu’s Collagen Source Solution Ball is a revolutionary new way of getting your daily hit of collagen and in the most direct way possible. With a high concentration of collagen (three months worth of collagen condensed into one pack), Chojyu’s Collagen Source Solution Balls are meant for direct application. Just open a pack, wet it with your toner, and apply it on the face—yes, it really is that simple! The world over, collagen has been consumed mostly as a dietary product to keep the skin feeling young and supple. But trust the Japanese to kick the b out of boring. Taking collagen supplements has always felt a bit extreme to me, seeing how I don’t need it—yet. But Chojyu’s Collagen Source Solution Balls did a good job of solving that problem for me. And for a lazy girl like yours truly, the ease of application is nothing short of a boon. Using the collagen balls feels quite similar to using a tissue to wipe the face at the end of a long, hectic day, only here, I prefer doing this early in the morning. Just wet the contents of each pack (there’s a different pack for each ball) with your toner, and use it to wipe your face. Relax your mind and allow the contents to be absorbed, and you’re done! 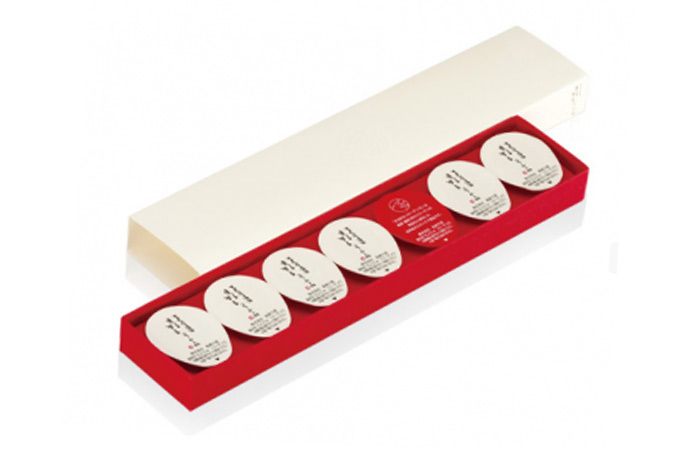 Most Japanese women swear by Lululun’s Balance Moisture Masks, and with good reason. A Japanese bestseller, the face masks are meant for daily use and are said to enhance the ability of the skin to retain moisture and absorb serums. Greasiness is prevented thanks to the addition of royal jelly and hyaluronic acid that also promote deep skin moisturization. Moisture balance masks for restoring freshness. Needs proper storage. Sheets run the risk of drying out if left in the open. To be frank, my fascination with trying this product was less about the efficiency, and more about just chilling with these masks on my face. And on that count, they certainly do not disappoint. Apparently, Lululun’s Balance Moisture Masks are a staple product in Japan with women buying these sheets in bulk. Personally, though, I found them just about alright. They did indeed refresh and moisturize, but not extraordinarily so. Maybe the hype around it caused my expectations to shoot up (always a danger with third party reviews), but considering its cost-effectiveness and ease of use, it isn’t hard to guess why they’re so popular. Give them a shot, you won’t regret it. Shiseido’s Tsubaki Damage Care Hair Conditioner, as the name suggests, is a conditioner formulated with the goodness of ‘tsubaki’, or Japanese Camellia oil. An oil rich in hair enriching nutrients along with oleic acids and amino acids, the tsubaki formulation contained within Shiseido’s conditioner treats multiple hair care issues of brittle hair, split ends and dryness. Formulated with Tsubaki—Japanese Camellia Oil, an age old Japanese secret for long and strong hair. Repairs damaged hair—brittle ends, split ends and dryness. Conditioners are a modern necessity—and if you aren’t using one already, then this is the perfect conditioner to get started (if you already use conditioners, maybe it’s time to convert?). Shiseido’s Tsubaki Damage Care Hair Conditioner has nearly everything going for it—a decent price point, divine fragrance, and visible results! Yes ma’am, it actually does what it says. Right from the first wash, you can expect a visible difference in how your hair looks and feels (mine felt baby soft and lovely). Unfortunately for me though, as a curly head, this is not a conditioner I can use long term due to the presence of sulphates. 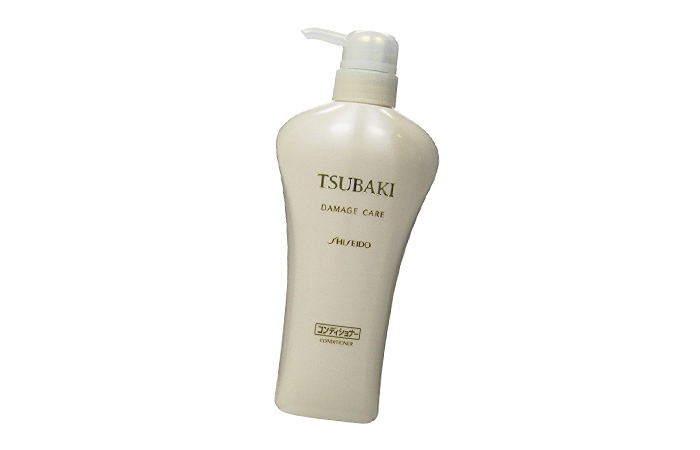 But if you don’t share my problem and/or don’t mind sulphates in the products you use, Shiseido’s Tsubaki Damage Care Hair Conditioner is one product you do not want to be missing out on ! With a high sun protection factor, the Shiseido Anessa Perfect Sunscreen SPF 50+ provides protection against both UVA and UVB rays. It is sweat-resistant and waterproof, ensuring that your sun protection is on even as you cool off on the beach on warm summer days. The hyaluronic acid present helps repair dehydrated skin. Clinically tested by FDA. Considering their near flawless skins, is it any surprise that Japanese people stock up on sunscreen like nobody’s business? Indeed, nowhere in the world will you find sunscreens with SPFs as high as in Japan—a fact I’m eternally grateful for. I have a medical condition known as PMLE due to which I’m highly sensitive to sunlight and must slather on enormous amounts of sunscreen before stepping out of the house for even 10 seconds. 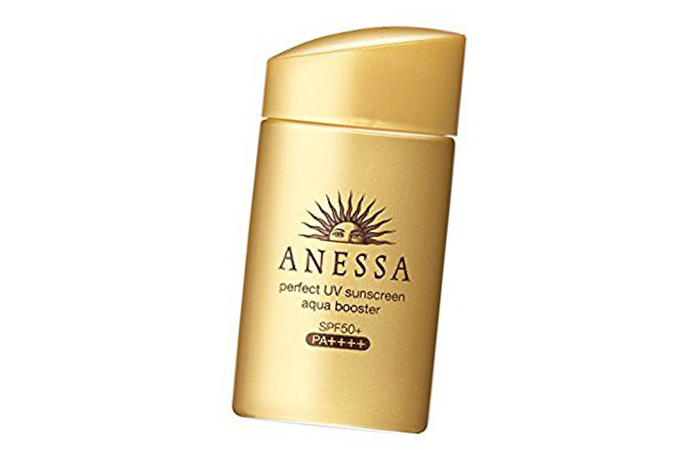 Unfortunately for me though, the SPF in the sunscreens available in our domestic market is as good as negligible, and this is where Shiseido’s Anessa Perfect Sunscreen SPF 50+ has saved my life, like literally. It has high SPF, spreads easy, doesn’t wash away with sweat, and even prevents dehydration. Just a small quantity of Shiseido’s Anessa Perfect Sunscreen SPF 50+ on a summery day, and I’m ready to take on the world! 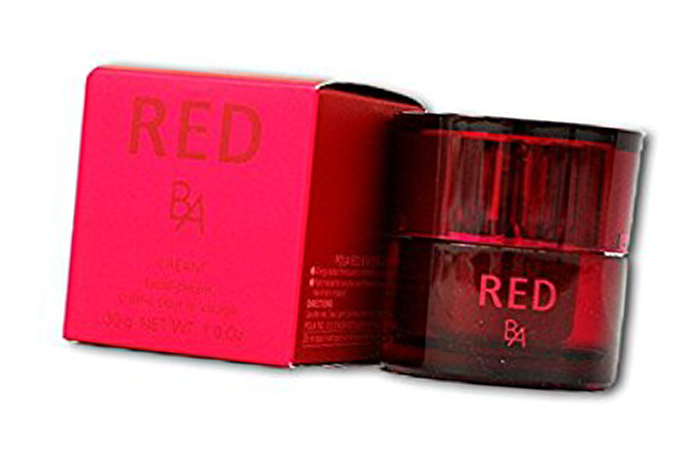 With an abundance of Ursolic acid derivatives, lotus root extracts, and plant proteins, the Pola Red BA Cream is a night cream that spreads gently over the skin. The high-quality oil present in the cream melts out and provides deep nourishment to the depths of the skin giving your skin the intense repair and conditioning it needs. My tryst with the Pola Red BA Cream was all thanks to my mother’s vanity. Apparently, Pola is massively popular in Japan for its effect on fine lines and wrinkles, prompting my mother to start using it (she wanted to get something for her fine lines). Considering she’d already been using it awhile, I decided to get her opinion on it instead of using it myself and here’s what she said, ‘it’s been alright so far. I’m a month into this cream, and while it does help lightening certain fine lines, you would expect a lot more from a cream that’s so expensive. It does nourish and soften the skin, however, so I’ll go through the entire bottle before I take a call on whether or not to buy it again”. The Hada Labo Super Hyaluronic Acid Lotion is a facial toner specially designed for dry skin that contains super hyaluronic acid—known to provide lasting and deep nourishment to the skin. Oil, fragrance, colorant, and alcohol-free, it is a lightweight solution that is perfect for reducing fine lines and sensitivity and firming saggy skin. The premium version comes with five different kinds of vegan hyaluronic acid. I came across the Hada Labo Super Hyaluronic Acid Lotion while reading up on Chizu Saeki’s Facial Lotion Mask technique. The fact that Japanese folk has amazing skin even in their mid-forties and fifties is a well-known fact, and thanks to Chizu Saeki for sharing their secrets to that. 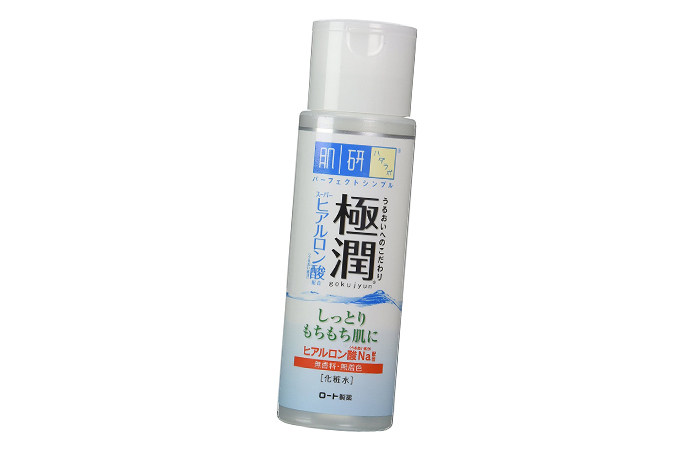 The Hada Labo Super Hyaluronic Acid Lotion is a facial toner that when used according to the Facial Lotion Mask technique presents astonishing results. To start with, all I did was to wash my face with my regular cleanser. Now, instead of getting the toner on my hands and applying it directly to my face like I usually would, I used it on small cotton squares soaked in water (making sure to remove excess water) that I then applied to my face for three minutes, and done! The difference in efficiency from using it like a regular toner versus, with the facial mask lotion technique, was mind-boggling. My skin immediately felt lighter and refreshed. When used at night, it was nice to see that the puffiness reduced a hell of a lot too, AND carried over to the next day. Say whaaat! I love this thing and can honestly not get enough of it. You should definitely get it. Miccosmo White Label is an entire range of products containing ‘carefully selected, Japanese made, placenta extract’ (yes, there is more to where this came from). The range has been designed to give the user soft and clear skin similar to that of a newborn baby’s. Don’t get so grossed out now, you guys, placenta in skin care might be quirky, but it’s a thing. Seeing how this product is specially formulated for dark circles, under eye puffiness, crows feet and fine lines around the eyes, I must say it did a fair job of solving not just one, but all those issues. I used it for puffiness while my mother tried it for fine lines and crows feet, and it actually worked! I’d certainly recommend it to you too, provided you’re ready to take the leap of faith with this one. Peace out. Hand moisturizing mist as an alternative to the regular greasy hand moisturizers. A decade ago hand moisturizers were a novelty product. Cut to today and you’ll find them in just about every other woman’s handbag. I wash my hands nearly a dozen times in a day, a bad habit as it strips the skin on the hands of essential oils. The result being that I could actually see my hands getting dry and wrinkly, like someone had transposed an old woman’s hands on a twenty-five-year old’s. Hand moisturizers, therefore, are a necessity for me. But if you, like me, would rather live without the greasiness of regular moisturizers, Shiseido’s come up with the simple solution we’ve all been waiting for—a moisturizing mist. It’s light, it’s easy to use and has zero stickiness. What more could one ask for? 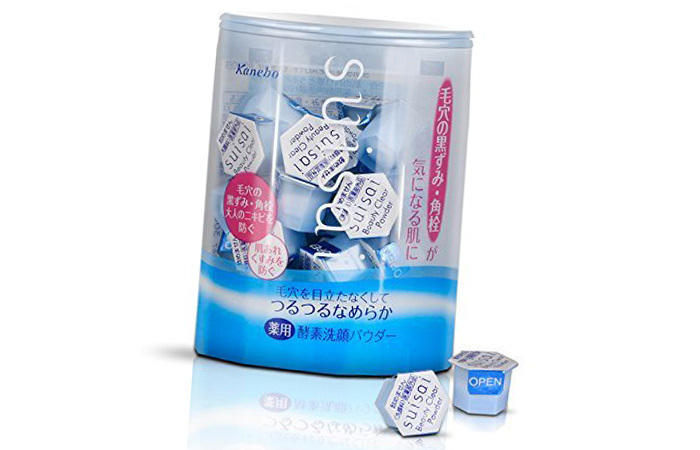 A cult hit in Japan, Suisai’s cleansing pods are an enzymatic formulation contained within individual pods of cleansing powder that work as a gentle exfoliant. Rich in ingredients like royal jelly and tofu extract, they help brighten and tighten the skin. Suisai’s beauty cleanse powder comes in easy-carry cleansing pods that make it possible to clean up on the go. All you need is to get some powder on the hands, add water and massage onto the face to create a gentle foam. Back when I received my sample batch of them, I’d carry a couple of pods with me wherever I went as I loved how clean and light my skin would feel after use. It isn’t too harsh on the skin and doesn’t cause any breakouts. My only issue with them was that they needed to be carried separately in a Ziploc bag as the packaging is flimsy and tends to tear. 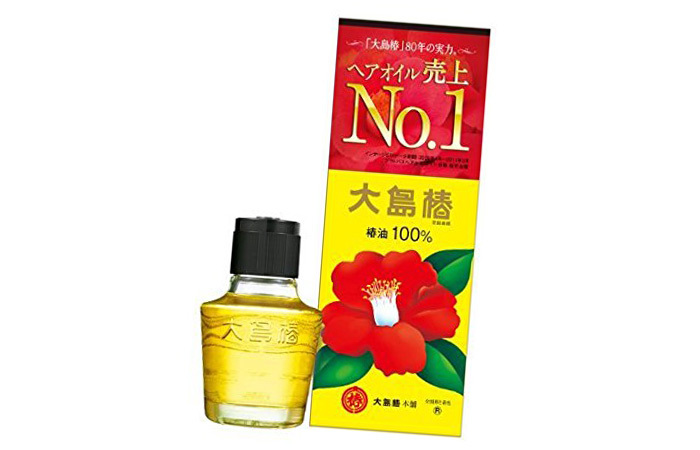 With 100% of camellia japonica seed oil, Oshima’s Tsubaki Oil is a natural way to restore the moisture and shine to your damaged locks. Packed with the goodness of oleic acids, the oil helps nourish dry hair, treat split ends and liven up dull strands. Can be used to moisturize the skin and face too. Tsubaki is an ancient Japanese beauty secret that has been used by successive generations of families in Japan. Almost everyone I know, comes back with a container of this from their trip to Japan. In fact, I too got my bottle from a relative who’d visited the place recently. 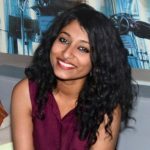 I have shoulder length curly hair that easily gets weighed down by heavy products. Which happened to be my exact problem with this oil (people with thick hair might not have this problem). Even the three drops recommended for use before styling, as stated on the bottle, felt a bit much for me, because of which I stopped using it on my hair. 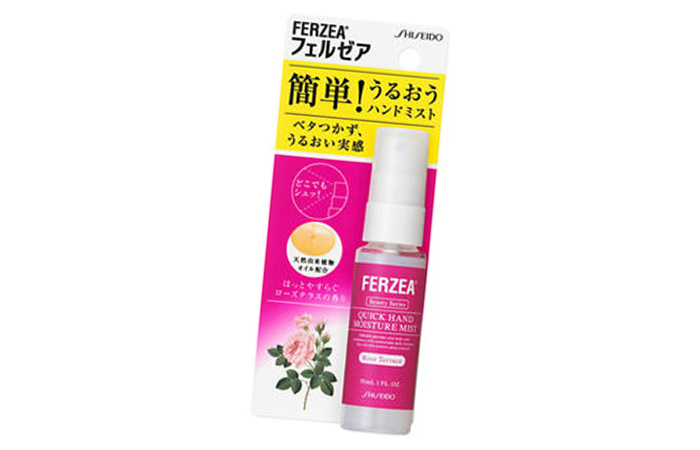 However, I found that the oil is great for use on the skin, especially during the winters. It’s nourishing, soft, and a little goes a long way. 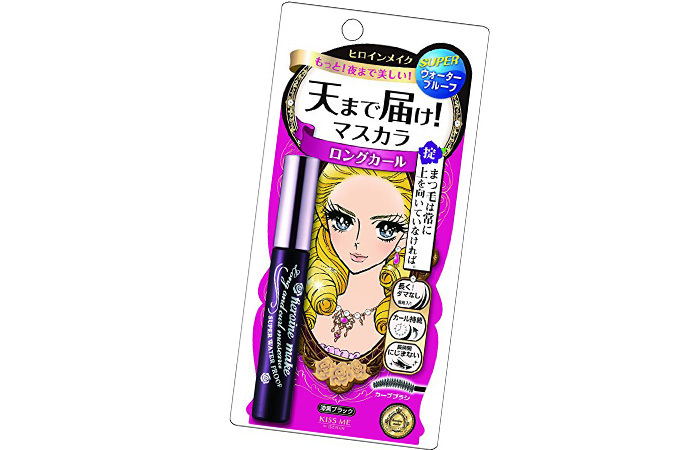 Isehan Kiss Me Heroine Mascara Long and Curl promises eyelashes that last for days. With an intense black formulation that provides great volume and curl, the Isehan mascara is a pocket-friendly product that is also waterproof. Isehan, where have you been all my life? If you had to pick just one product from a bunch of Japanese beauty products thrown at you, this ought to be your pick. No mascara has ever seemed to work for me as I’m dark and have moderately generous lashes. Isehan’s Kiss Me Heroine Mascara Long and Curl turned out to be a game changer for me though. Right from the first stroke, it voluminized and curled my lashes to the point that I look like I’m wearing falsies (that’s when you know it works!). I haven’t had a chance to test out its ‘super waterproofness’ yet, but by all accounts, that’s a win too. I don’t think I’m ever going to get myself any other mascara, I’m sold for life. You would be too, try it! 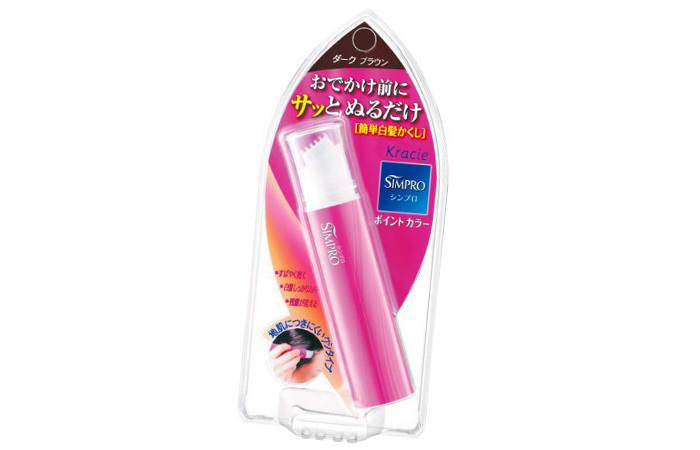 The Kracie Simpro Hair Mascara has been designed to save you from the hassle of constant dying. Touch up the roots with the easy to use comb applicator that finishes dye application in just 5 minutes. The natural collagen formula helps in maintaining healthy hair. The unbelievable happened a few months ago—I spotted my first gray. It wasn’t quite the earth-shattering event I expected it to be, and thankfully the grays haven’t multiplied, but since I don’t yet qualify for a full-blown dye job, Kracie’s Hair Mascara was definitely a winner. The comb-like applicator is a huge plus over the brush kind. It does a fine job of concealing the grays and stays on for a decent amount of time too. As of now, my mother’s been using it more, to touch up her roots, and she loves it. Saves the need of having to dye them hair every month just coz a tiny patch shows up gray. Definitely a keeper product. If seeing is believing, then I guess all of us should be converting to adherents of the Japanese beauty industry with due haste. Ancient beauty traditions combined with modern science have made sure that in Japan, there’s something for everyone. I have a list of my somethings. Have you chalked up one for yourself yet?